Yo! What Up Dawg! This is The Review Rapper MC T-Dog in the hizzay! The plotz iz: Nothing! There's no plot at all. It's just scenes cobbled together with rappers "acting". I guess Big Moe and E-40 put in good performances, but I can't tell them apart (because they're both overweight rappers, of course). Here's what I can gather: There's a gunfight, some talking in a poolhall, and another gunfight stretching the running time to 85 minutes. 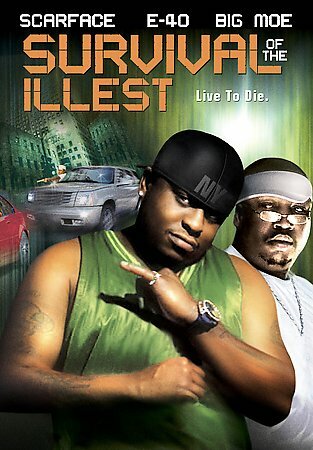 The best part is the opening shootout because when the homies get shot they forget to die. It's funny. Survival Of The Illest is no Juice (1992) or In Too Deep (1999) . It's more like an even cheaper version of Urban Menace (1999) or Full Clip (2004) if that's even possible.